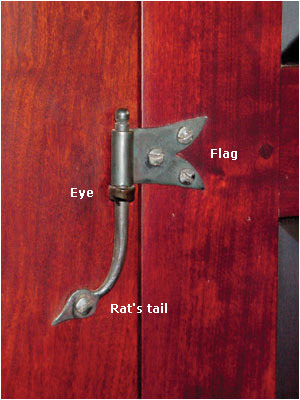 A rat-tail hinge consists of 3 parts: the 'flag', the rat's tail (the hinge pin) and the eye which is attached to a threaded shaft and has a nut. The eye is located on the frame of the cabinet and determines where the flag will be on the cabinet door. First locate where you want the flag to be, and then drill a hole for the eye so that the eye will support the flag from underneath. Secure the eye with the nut. Then slide the rat's tail up into the eye and check its position by sliding the flag over the tail from the top. Once you are sure that all is where you want it; pre-drill the hole for the screw in the rat's tail and mount the tail. Mark the holes in the flag and pre-drill. Mount the flag to the door and slide the door onto the rat's tail. Rat-tail hinges are available in rights and lefts. See the drawing to determine which you need. In case you get them mixed up: the difference between them is the way the tail sits on the frame. One way, it is rocky, the other way it sits nice and flat. You should be able to determine which is which quite easily. The flags and the eyes are the same, only the tail changes for a right or a left. All of our packaging is marked right and left.